My family and I just got back from a relaxing trip to visit my husband's family. So when I sat down this morning to write a post for MommyMaestra, all my creative juices were flowing and instead I wound up working on a new printable. Inspired by Valentine's Day, I decided it was time to highlight a famous Latino in history: Frida y Diego! It's almost done, but I decided to go ahead and give you a free sample of the activity pack. This little reading passage is best suited for children in 2nd through 4th grade. They can even color in Diego and Frida. The complete pack contains a reading comprehension page with multiple choice questions, another reading passage on Frida's artwork, an activity sheet for students to create their own self-portrait based on what they learned, a short reading passage about Diego's art, and another activity sheet for sketching out their own mural to go on the side of a school house. There's also a reading list to explore these artists more thoroughly. It will be available in the next day or two. 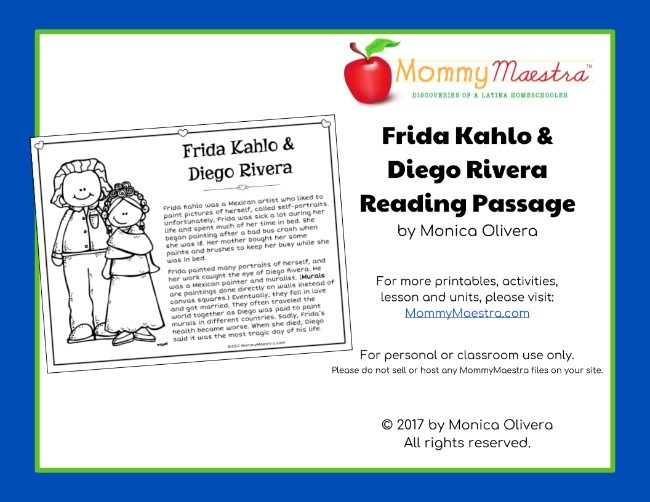 In the meantime, download this child-friendly reading passage about Frida and Diego!